The latest sad-clown outing to star Jim Carrey (there have been a few) is Kidding, which reunites him with director Michel Gondry (Eternal Sunshine of the Spotless Mind). Carrey plays Jeff Piccirillo, the titular host of a 30 year children’s TV show Mr. Pickles Puppet Time. While he is one of the country’s most loved presenters, Jeff is privately dealing with a marriage break-up and the death of a son one year earlier. The TV show is a family affair, with his father Seb (Frank Langella) its executive producer and sister Dierdre (Catherine Keener) as head puppeteer. Struggling to keep his spirits up alone in low-rent accommodation (despite decades of TV success), Jeff has occasional access to his surviving son Will (Cole Allen) from estranged wife Jill (Judy Greer). One day Jeff suggests an episode about Death in order to offer something meaningful to his audience. But Seb is against the idea and how it will impact on his brand. 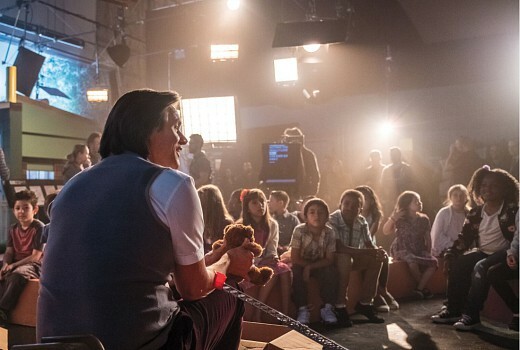 Kidding divides its time between domestic scenes and TV backstage conflict in ways that don’t quite meet in the middle. The script attempts to throw linear storytelling aside but results in an uneven experience for the viewer. Carrey underplays constantly, in a seeming effort to prove his dramatic skills in a performance that needs further light and shade. On-screen Mr. Pickles is smiley and softly-spoken. “Off-screen” Jeff is the same to the point of being a dull hero. Some of the dialogue was also odd. If people working in television really speak like this then American TV is in more trouble than we realised. At least this is leans to some brevity at 30 minutes in duration. Kidding needs to take a stronger commitment to its genre to avoid becoming an indulgence designed to net its star award nominations. Kidding episode 1 is now screening on Stan. Very surprised with this review. While not perfect, the writing in this show pretty terrific and the story turns for the most part are surprisingly original. I find that the first two episodes have been incredible. And as Snorlaxation said earlier, Jeff is a whisker away from having a complete meltdown… I love that uneasiness. When Jim Carrey acts (Man On The Moon; Truman Show; Eternal Sunshine…) he is absolutely one of the finest actors of all time so I’m definitely going to get stuck into this. It’s a great concept but I just can’t stand Jim Carrey. After years of playing very similar screwball characters (e.g. The Mask, Ace Ventura, Liar Liar etc.) I will never be able to take him seriously. Even in interviews he tends to be quite juvenile and irritating beyond tolerability. If he had taken a more balanced approach to selecting roles throughout his career, then perhaps I may have perceived him differently, but as it stands, I think the lead role has been grossly miscast. Have you seen The Truman Show/Eternal Sunshine of the Spotless Mind? Very different to his usual over the top characters and amazing movies to boot. Definitely worth checking out if you haven’t seen them! I reckon there is a series in Truman Show as a statement on Reality TV (with another actor). Seen the first two episodes and I absolutely love this show. I’m just waiting for Jeff to completely snap, love me some dramatic Jim Carrey.